Hear my thoughts on the importance of being involved in advocacy and the dissemination of behavior analysis. Being involved in the discussions will ensure behavior analysts are defining their practice and not others. Uphold the ethics and rigor of the field and do your part to protect the public, as well as the profession. Abstract: As behavior analysts we believe behavior change can be achieved, whether that is organizational, individual, or systemic change we are talking about. Changes in public policy at both a state and federal level in the United States have continued to impact the practice of behavior analysis in recent years. These developments have made it more important than ever for behavior analysts and those impacted by these policies to participate in public policy efforts. This presentation will discuss the basics of public policy from a behavior analytic perspective, review public policies relating to the practice of behavior analysis, and provide useful strategies to increase the effectiveness of grassroots advocacy efforts. Video excerpt - Quick tips about identifying priorities when advocating. As behavior analysts we believe behavior change can be achieved, whether that is organizational, individual, or systemic change we are talking about. Changes in public policy at both a state and federal level in the United States have continued to impact the practice of behavior analysis in recent years. These developments have made it more important than ever for behavior analysts and those impacted by these policies to participate in public policy efforts. This presentation will discuss the basics of public policy from a behavior analytic perspective, review public policies relating to the practice of behavior analysis, and provide useful strategies to increase the effectiveness of grassroots advocacy efforts. Participants will name two barriers impacting effective legislative advocacy, list at least three tips for improving local grassroots advocacy efforts, and will review relevant case studies to connect behavioral concepts to the area of grassroots advocacy. (May 2017) Changes in public policy at both a state and federal level in the United States have continued to impact the practice of behavior analysis in recent years. These developments have made it more important than ever for behavior analysts and those impacted by these policies to participate in public policy efforts. Our panelists will discuss the basics of public policy from a behavior analytic perspective, review public policy implications of emerging research, and provide useful strategies to increase the effectiveness of grassroots advocacy efforts. 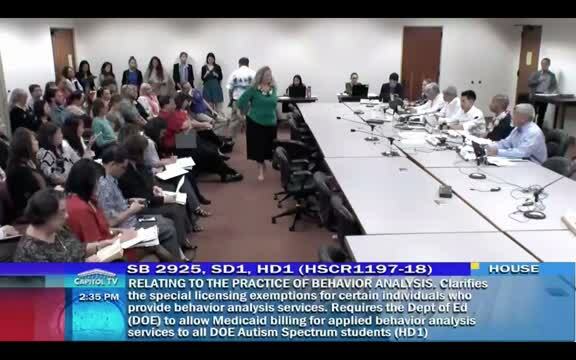 The panelists will share their experiences in both supporting and opposing various public policy initiatives including autism insurance reform, defining essential health benefits, licensure and regulation of the practice of behavior analysis, telehealth, and more. Finally, we will conclude the panel with a discussion of how behavior analysts can use this information on public policy and grassroots efforts to increase participation in public policy related to other social issues. In this webinar-style course, Lorri Unumb, J.D. discusses the process that she and other grass roots level reformers used to successfully change state level legislative policy across the nation and to pave the way for insurance coverage for ABA.